I've got an interesting story for you today. 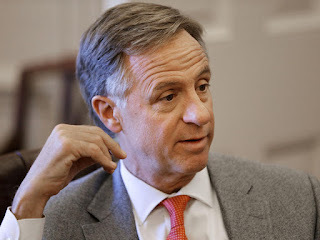 Q - Did you know that Tennessee Governor Republican Bill Haslam (photo), with a net worth of $2 billion, is America's richest elected politician? A - Haslam was sneaking around with his business cronies to privatize all Tennessee property, but Campus Workers exposed his scheme. You might think Haslam is going to vote for fellow billionaire Trump, but you'd be wrong. There is no brotherhood among greedy men. Here's why Haslam isn't voting for Trump. Don't think Haslam has given up on his plans to privitize Tennessee. Now that his plan is out in the open he's trying to sell it to fellow Republicans who, thus far, have resisted his efforts. Billionaires running for office are different than millionaires running for office. Everyone in national and state politics today is a millionaire (or darn close to it). Billionaires are rarer...thus far. Looking at Haslam's attempt to cash in using his office is a precursor to what we can expect from him...and Trump (if elected). My final thought: Bored billionaires seeking power is something we will all have to be on guard about in the future. Unless that billionaire has a flawless history of fairness and high morals (and a record of service and sacrifice to the country) they shouldn't be trusted.